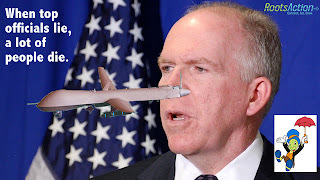 John Brennan's confirmation hearing to become head of the CIA will take place on Thursday, February 7. There is suddenly a flurry of attention around a white paper that lays out the administration's legal justification for killing Americans with drones overseas, and some of the Senators are vowing to ask Brennan "tough questions." Give your Senators some ideas and ask them to oppose Brennan's confirmation. Whether or not your Senators are on the Intelligence Committee, they can publicly raise concerns with Brennan. I have a few suggestions, and you can add more of your own. Just click here to make sure your Senators can't claim they didn't know what needed to be asked.